A unique treehouse cabin rental nestled in our pine forest on 60 private acres near Sylvan Beach, Rome and Oneida, NY. A one-of-a-kind lodging experience! This unique and cozy treehouse stirs the imagination and allows anyone (both young and old) to enjoy the tranquility of nesting amongst the trees on our 60 acre nature sanctuary at Wellnesste Lodge. This upstate New York treehouse is named in honor of English primatologist and anthropologist Jane Goodall for the amazing work she's done in the name of conservation. Our treehouse is the perfect place to getaway from it all. 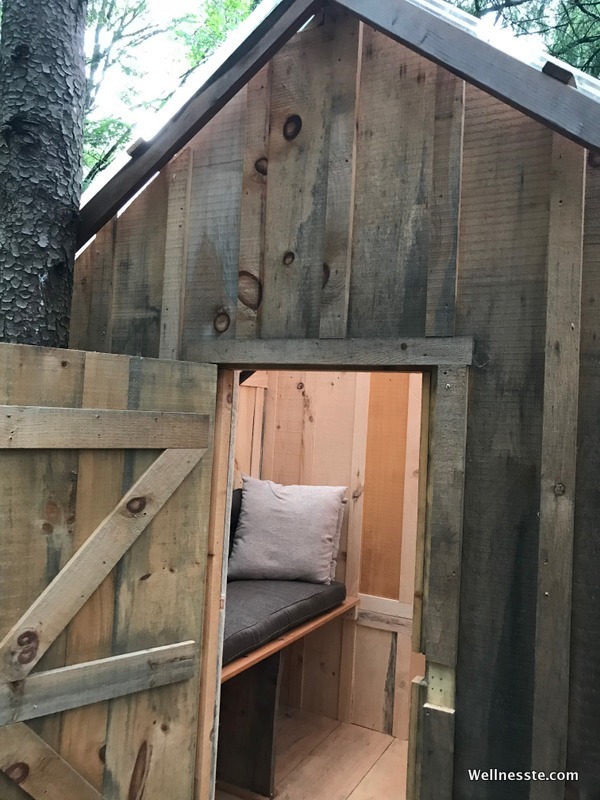 Set in our pine forest, the treehouse has two stories with an open air 2nd story balcony, reading nook, kitchenette & sleeping loft (up a small ladder). This semi-rustic treehouse has electricity & heat and in addition you have access to a detached full bathroom with shower. 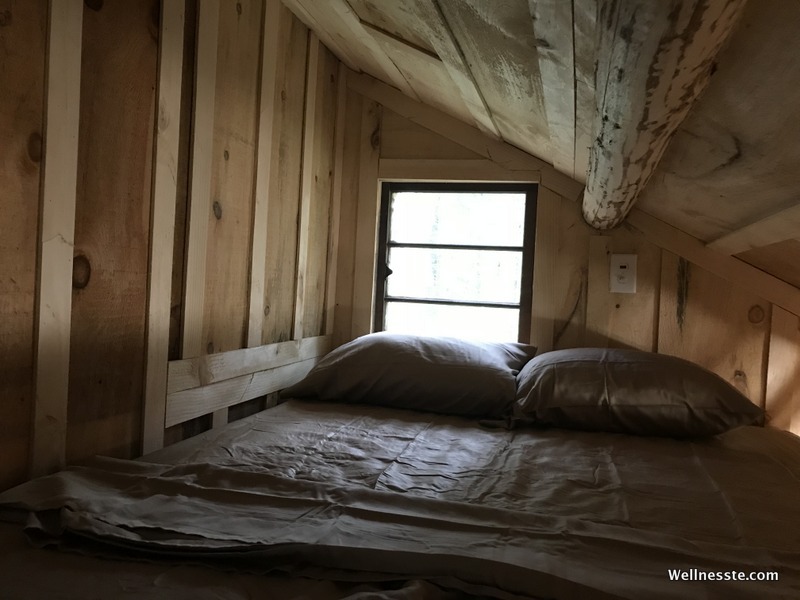 Our treehouse cabin rental has many unique touches including white pine walls (harvested from our property and custom cut by local Amish tradesmen); a see-through second story roof; built in reading nook; and a one-of-a-kind treetop view of the forest. NOTE: access to the sleeping loft as well as the 2nd story are both via built-in ladders. We have 1/2 mile of private river frontage, hiking trails, a volleyball court, fire pits, two spring fed ponds, free range chickens, friendly rescue mutts (yes, we're pet friendly) and more to enjoy here during your stay. In addition, we have a shared screened in 3 season room with picnic tables and games as well as a shared BBQ grill and more. There are lots of outdoor activities in our upstate/ central NY area including hiking, biking, swimming, fishing, river tubing, kayaking, snowshoeing, cross-country skiing, downhill skiing, snowmobiling, snow tubing, brewery tours, national parks & monuments, museums and more. Amenities: Fridge, Microwave, Toaster Oven, Hotplate, Dishes, etc. Please note: There is a fully equipped detached full bathroom that is shared with guests staying in our other small cabins. Goodall's Treehouse Cabin is a “semi-rustic cabin” which has electricity & heat, but no running water. Guests are provided water for drinking, dishes, etc.